Is it possible to use selector logic to get if the adjacent cell is a specific type of cell when using the FloorPlanBuilder? I know the GridBuilder selectors have the query node, but the same option doesn't seem appear in the selector blueprint when i create one for the FloorPlanBuilder. I have made ceilings for my rooms by making another ground mesh with a vertical offset which works fine, except when it decides to place a stairway on one of the walls. At that point the stair and connecting doorway will intersect the celing mesh. How do I tell it to not render the ceiling mesh above a stairway please? Just wanted to report that the content examples only work if they are individually put in the root folder. If you create a parent folder, say "DungeonArchitect", and copy all of the examples in that folder instead, the theme paths are not found and you have to set them manually, which defeats the purpose of the content. It would be nice to have them in a parent folder to keep things better organized. I wouldnt want everything in root. 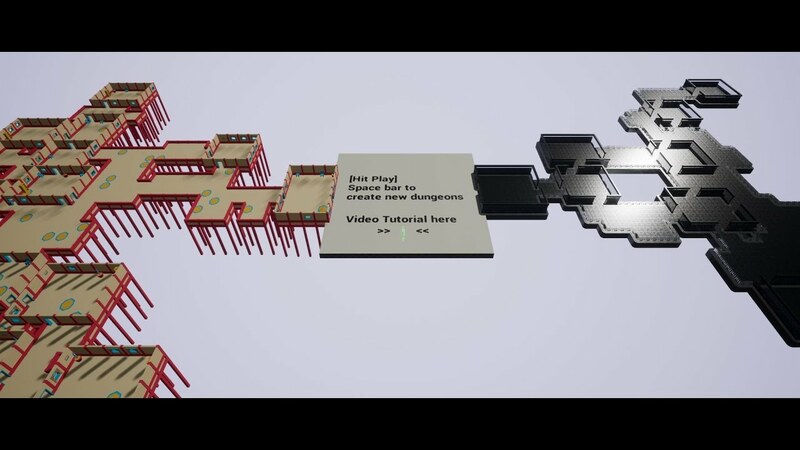 -The "floorPlan" demo is missing a player start actor, so the camera does not move by default on play. Last edited by Sajid; 03-28-2017, 10:01 PM. As for the content folder structure, I prefer placing it in root as it is easier to convey the message of directly copying it to the content without any confusion of an additional step of creating a sub folder (if individual folders are to be copied). Thanks for the help Ali. I can't find mention of this anywhere, but does the Dungeon entity randomise the seed every time I start a new game? If not, how do I make it do so? When I used this when you first released it, there was a 'runtime' version of the entity and a static one. This doesn't seem to be the case now and I'm not sure how to make it a different layout every time I play. It's come a long way since then in lots of ways, so great job mate. P.S - did you ever get anywhere with the Cave generator and terrain generator etc? [MENTION=305583]erbmur[/MENTION] Sure, you can do that with platform volumes. This doesn't work with height variation, right? The marker replace volumes can be tricky too. I want generate dungeon on server and replicate result of this to client. I found only one way: Make Actors out of StaticMeshes and replicate them. Maybe i miss somethings? Last edited by CyberKatana; 03-31-2017, 06:47 AM. Identify who is the player 1 (generally, the host) and player 2. You make player 1 build the dungeon and then share the dungeon seed with replication or API call (in case you are using a Cloud Service like us) to another player. Then, he will build the dungeon himself. In this way, both players will play in the same dungeon. Another way of doing this, if you can use cloud code, is to make server generate the seed for both players and send it via message to them. Just wanted to check up on 2.6. I'm assuming it hasn't come out yet, but I recall once in the past when the update didn't go up on the coderespawn site and only in the marketplace so just checking. Objects which must be replicated you do not spawn at client?